We understand the commitment that you make by being married to a member of the military. This community is a place for spouses of military personel to talk and discuss the things that impact their careers and their lives. 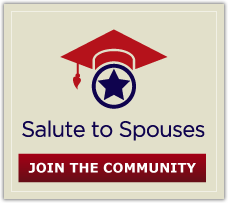 Joining the community is simple (and safe), and you'll be connected with hundreds of other military spouses to share your thoughts and ideas about education, careers and family. Members automatically get access to our eNewsletter which is a great summary of the month's best articles and blog posts. Connect with Salute to Spouses on Facebook, Twitter, YouTube and Delicious!